The edition of the DIVE lectures must match the edition of the Saxon books. How do I download & stream lectures on my computer or device? Student Placement Chart This page also has information on our free consulting service. My daughter struggles with dyslexia and other learning challenges, so finding a curriculum that "fits" is nearly impossible. 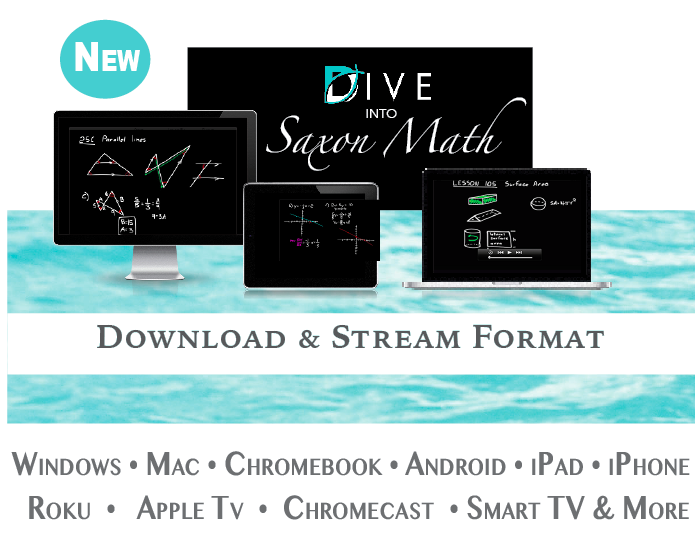 But Shormann math has both an excellent curriculum, with clear explanation of Saxon Math and helpful repetition, , AND an excellent learning specialist who answers all of my questions about how to modify DIVE and ,maximize success. I'm thankful to God for the Shormann's and the gift that they are to our homeschool! This has been such a huge help to me this school year! It enables my 10 yo son to work independently on math so that I can focus my time and energy into other subjects that need more 1:1. My son and I have been using Saxon for three years from 3rd to 5th grade. My son who has reading difficulties took long time to finish each lesson. I love Saxon but I was about to give up because it became such exhausting task for me and my son. Now, he can watch the DVD lesson and breeze through the problems. He is progressing nicely. Thank you!